Living in Chicago, I’ve enjoyed learning more about different cuisines and beginning to see unexpected connections between them. This recipe, for instance, is about as Polish as Korean food is likely to get. To friends who’ve never eaten Korean food but are more familiar with Eastern European cuisine, I’ve said kimchi is like sauerkraut but less sour and more spicy-sweet. 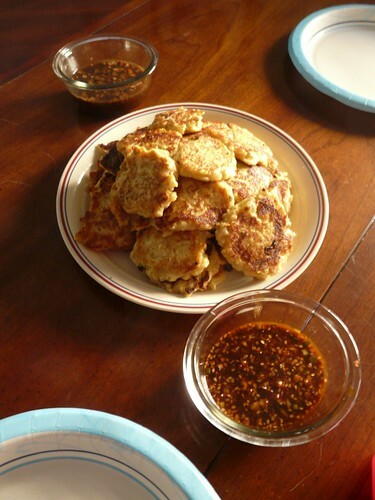 Mixing sour kimchi into potato pancakes makes the similarity even stronger, but the combination of sour cabbage and fried potatoes works equally well with both versions. The starchy potatoes take the edge off of the spicy kimchi and balance the sourness well. This is a nice quick & easy way to use up the last of the kimchi when it starts to get more sour and pungent and wilted at the end of the jar. Chop the cabbage kimchi finely and press to remove any extra liquid. Boil or microwave the potato and mash it, adding a little milk if required. Crumble the tofu and press to remove extra liquid. Mix together the kimchi, potato, tofu, flour, egg, garlic, and any salt and pepper you like to season. Form into small round patties. Heat a skillet or wok over medium high heat and warm the oil, then add the patties and fry until golden brown on both sides. You may need to add a little more oil as you go. Drain on paper towels. Serve with dipping sauce – so delicious! This recipe makes enough for 2 people – I found the recipe under street food & snacks, so keep that in mind for the serving sizes. Looking at the photo, keep in mind that I multiplied the recipe several times to make enough for guests.